Even though I'd rather chew on broken glass than have to reach out to Fein USA (or Fein Germany, for that matter) for help, I found myself earlier today needing to ask for some assistance from Pittsburgh. Why broken glass? Well, every interaction I've ever had with Fein over the last couple of years (since before even becoming a customer) has gone like today's did. Nowhere. Usually they just don't bother to answer my emails. Today, however, was an exception. What I encountered is sure to produce confused facial expressions from all who read past this point. You see, what I discovered is that the email server at Fein USA is configured in such a way as to prevent Joe public (hey, that's me!) from transmitting an email with hyperlinks, attachments and/or embedded images. This restriction presents a serious problem when the information you seek is the part number for something you've only seen a couple of images of online. On its own, this hurdle wouldn't have been such a big deal. However, when this encounter turns out to be enigmatic of literally every interaction you've ever had with Fein, you may be better equipped to understand why I immediately went from zero to ten. This was about more than a part number, after all. Realizing this was going to take some effort, and not wanting to add insult to injury by picking up the phone only to be met by someone on the other end who has no idea what I'm talking about (another experience common to my past interactions with Fein), I took a few minutes to fire off an email that was as critical of Fein the company as it was insistent of my need for assistance. Wise by now to the email server's whims, I made sure not to include any links or images in this transmission. In short order (remarkable speed given my past experience) I heard back from a person of the Customer Service Manager persuasion. His reply was brief but failed to include the kind of on-your-feet thinking I was longing for. So, taking it upon myself to do his job for him, I next offered a couple of workarounds, all aimed at my being able to one way or another send him the links. The last thing I wanted to do was to play "telephone" with a long web address, actually three long web addresses. His response back, also brief, was so devoid of what one thinks of as the act of providing "Customer Service" that I almost filled my diaper. "This could be another problem child, like Bobby? Just forwarding this to you as an FYI… Betty"
Oh, now I was loaded for bear. I fired a warning shot back in John's direction which consisted of a preface to the body of my original email, the latter of which I copied into a new email and from which I took care to remove the offending links and image. In short, the preface warned John that the "problem child" had returned and was now going to be taking matters into his own childlike hands. 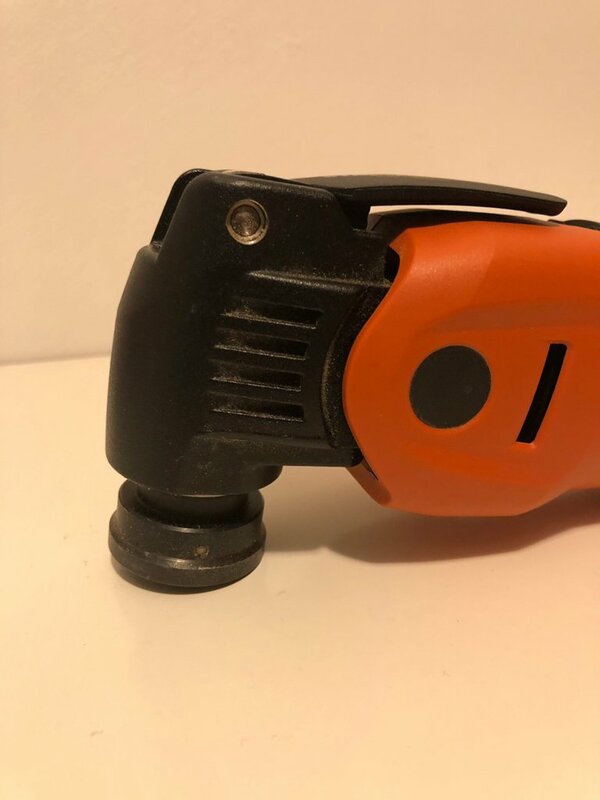 I went on to state that I would be posting a rather scathing critique of the Fein organization on the company's social media page and that I would append to that, the product links and product image that had been the source of so much angst. Doing so would ensure the email's ability to to sneak past the watchful eye of the Fort Knox...I mean, Fein, email server. I also instructed "Dear John" to please navigate his way to his company's social media page and to my uploaded post so that he could locate and then follow the included links, the result of which would finally and quite gratifyingly consummate this brief but no less stupefying relationship. Did I mention that I also uploaded a snip of the most incriminating part of the email thread? Yup, I did that. And that's where I left it. As chance would have it, the business day would come to an end without me having heard back from anyone at the Fein organization. 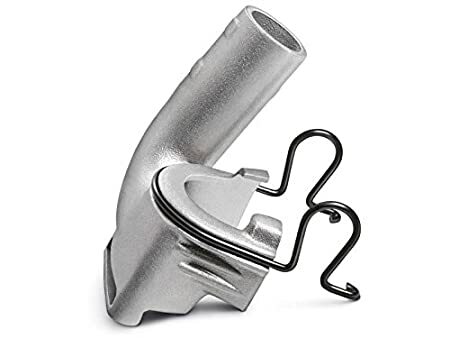 Following some additional time spent on the interwebs searching, searching, searching, I managed to stumble upon the part number for the accessory I was curious about. I'll remind you here that this was the culmination of hours of unpaid work. Where did I find the mystery number? As luck would have it, I'm pretty web savvy, so I just happened to identify the part number as the series of numbers appended to the web address of the page on a retailer's website that's dedicated to the allusive accesory. Had the part number been listed on the page (where, of course, it belongs) I would have noticed it long before I'd reached out to Fein and I would have had something other than just an image to go on. But, then, I may not have had this story to tell. We'll never know. 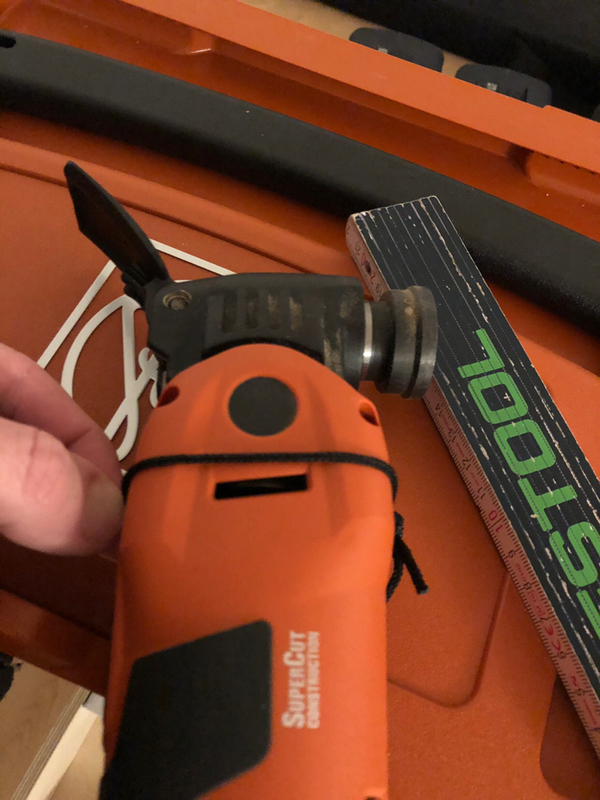 With the part number in hand I quickly sent an abbreviated email to the Fein retailer to ask if they'd ever tried to fit the accessory (which I was finally able to describe with a valid part number) onto the latest version of the Multimaster. I expect I'll receive a reply sometime tomorrow. No thanks, mind you, to the company that manufactures the two products featured in this story. The End. Actually, it's not completely "The End". 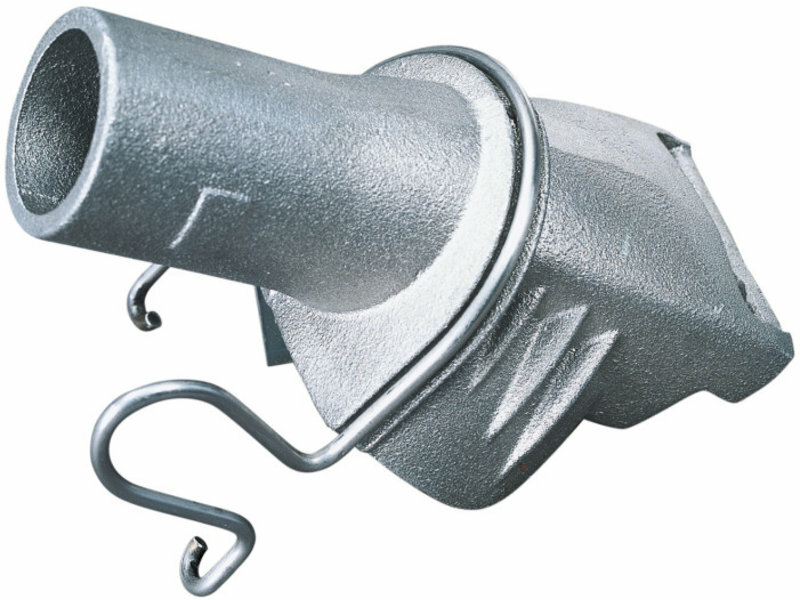 Has anyone ever held the following part in their hands and tried to install it on the latest iteration of the MultiMaster or on the current version of the Vecturo? And before anyone queries....yes, I'm aware of the forthcoming cordless Vecturo and yes, I'm also aware of its updated (and very effective looking) dust collection attachment. 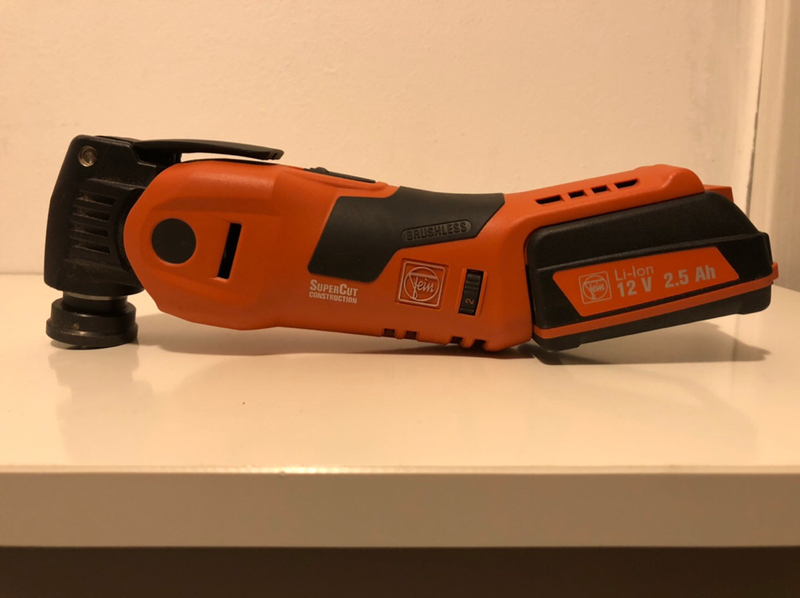 Also, yes, I know that Fein manufactured the existing Vecturo and that it also will be manufacturing the soon to be released cordless version. Hence why I'm asking about the compatibility of this one accessory between these various makes and models. Edit - The part number for the (apparently) new bolt-on version of the dust shroud is 32133021010. Re: Fein &quot;Suction&quot; Shroud and the Vecturo and/or MM? The first one you are showing (without the spring clip) is the DE unit for the current Fein SuperCut! This one, I have for my Cordless SuperCut AFSC 18. If you need any measurements etc. Let me know, I can do this over the weekend. The one you are showing later (with spring clip) is, to my research, the „old SuperCut“ version (hence, this could/should fit the Vecturo, which should basically be an old SuperCut. The Multimaster cordless has no dust extraction, if I recall correctly. The Multimaster corded has a tube that runs in the underside an has a ring around the tool/blade holder. (Optional accessories). - SuperCut AFSC18: speed dial on the left hand side of the tool, when viewed from above, also next to the battery. Which is, given I reall the manual on my multi master correctly, for use with the sanding foot and, given I correctly recall the experiment I made with it, not that useful (to put it mildly) when used with a blade. 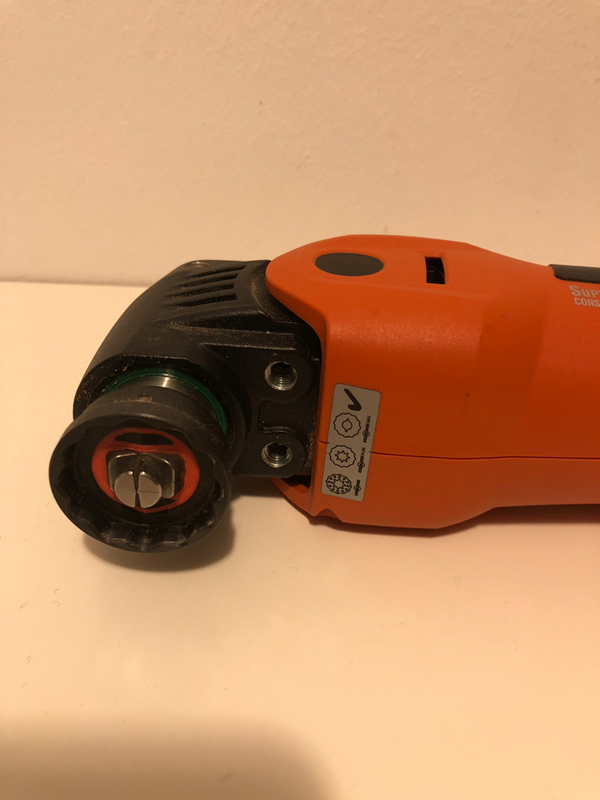 Re: Fein "Suction" Shroud and the Vecturo and/or MM? I read the story, although I am not sure what your question was to them. I learned long ago that almost all companies do not allow links and attachments in emails. The reason is security. You could replace Fein with the name of any big company & the story would be the same when it comes to customer service. All of them talk that they have great customer service, but they do not. Festool is a unique company when it comes to customer service & has spoiled their customers. I have and use the attachment shown. 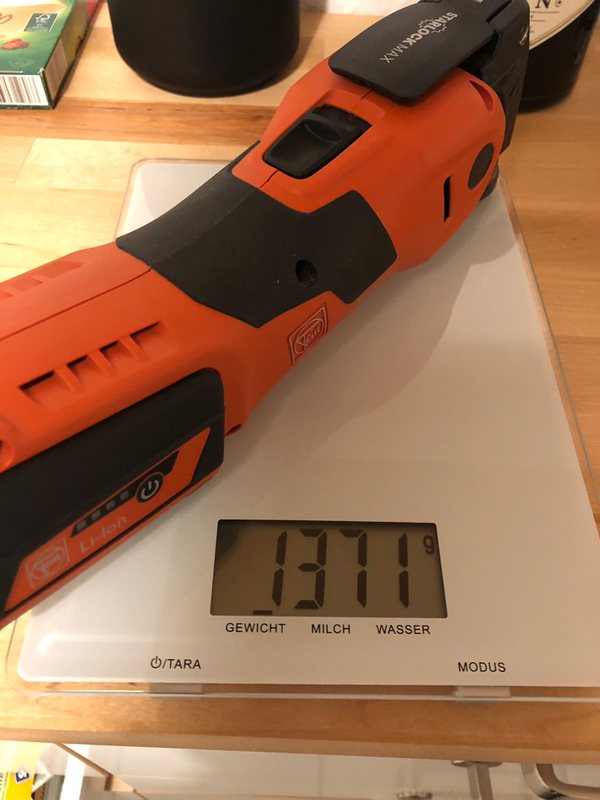 I bought it from Beaver tools not long after Toolnut offered the Fein Supercut on sale in a systainer. The two Supercuts are the older ones, not the new blade capture kind. I also have an older Multimaster and it does not fit that tool. I use it for making drywall cuts and it retrieves probably 90% of the dust created. I used it last in my kitchen in a french door retrofit. It worked fantastic for keeping the mess to a bare minimum. The dust that did escape was heavy enough that it fell straight down and did not float around the room. Simple, "Do these two components mate together?". The response? Bewilderment followed by crickets. Given how 'hot' dust collection is right now; and given that the MM is seriously lacking in this department; and given that Fein produces these two components; and, one would think, is familiar with each (and therefore should have foreseen the question); the dear-in-in-the-headlights response that I received was as humorous adn frustrating as it was so indicative of the continued failure of this company to a) provide it's associates with what they need to properly do their jobs and/or b) employ people who are up with the times and/or able to think outside of the box. Honestly, the first time my eyes came to rest on the two-bolt dust shroud - literally in the millisecond that followed - my thoughts went immediately to, "hmm, I wonder if this might bolt onto the MM?" I can't be the first person to have this totally unoriginal thought. And I don't even work for the manufacturer! I've never really seen a customer service employee of a company of that size with more than cursory knowledge of the stuff they sell. If you're lucky they know who to direct you to. Your best bet is usually a passionate well informed retailer, or at least it is in my experience. My commisserations for your frustrating experience though. @grobkuschelig - Thank you for the offer! 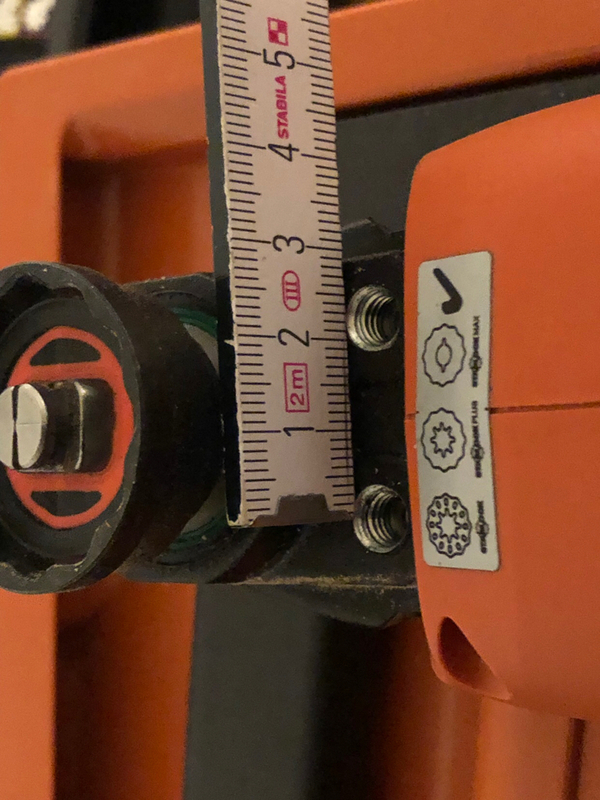 Yes, if you would, please provide the center-to-center measurement (in mm) of the two threaded accessory mounting inserts in the head of your SuperCut. Also, please measure the circumference of the SuperCut (in the two locations shown below). I’m not...what’s the skinny on the cordless Vecturo with dust collection? And if you’ve seen this dust collection attachment, can you post a picture? And what’s the part number for that Fein adapter that you finally found in a web address? Oh, yea, the part number. Sorry about that! It's 32133021010. You can also locate it by doing a websearch for "Fein suction" which, as a matter of fact, is the name for the part. Not real intuitive, I know. @TinyShop ahhh...very nice! Thanks for the info! The hole distance seems to be the same. I would have guessed so as well, since it keeps compatibility with the Fein depth stop etc. across their range. For the smaller circumference, I measure roughly 190mm. I guess the „head assembly“ is the same to keep the parts here as well. For the larger circumference, I measure roughly 230mm. It does not feature the „lump“ the Multimaster has. 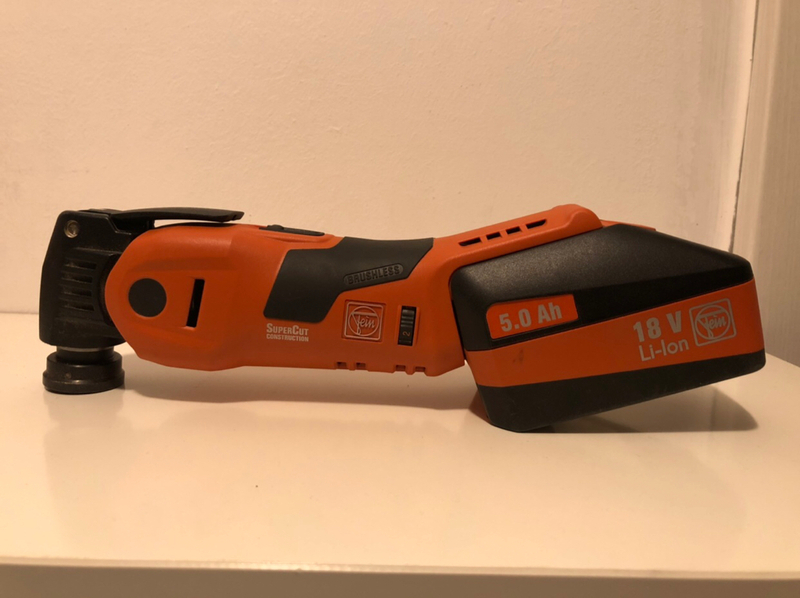 It also runs on the Fein 12V range (the brushless motor is a „multivolt“ capable unit, running on 12V, 14.4V and 18V batteries). This can make it a nice compact and light unit, if needed. Comes in at just 1.371 kg. In the last post, it was pictured with the 5ah battery, see below for the 2.5ah 12V. @grobkuschelig - Thanks so much! Your info pretty much validates the assumption I have that the bolt-on dust shroud will fit the MM. I think we can now confidently assume as much given that a) the bolt hole patterns are identical, b) the shroud only covers the head of the tool and c) that the heads of the tools are identical. You've been a great help and between the two of us we've supplied far more in the way of concrete data and basic knowledge than I've received from FEIN U.S.A., the latter of whom, I should point out, still hasn't bothered to reply. I should also mention that, with one exception, none of the dealers that list this dust shroud for sale on their websites have yet bothered to reply either. The one who did respond was unable to weigh in because they are presently out of stock of both the MM and dust shroud. This particular dealer did take it upon themselves to contact FEIN Canada (this dealer happens to be located in Canada) but they too were unable to answer this basic question. Good grief! Which just reinforces how pleased and appreciative I am with the various interactions that I've had over the years with Festool. If only every tool company out there was as responsive, knowledgeable and willing to assist as they are! 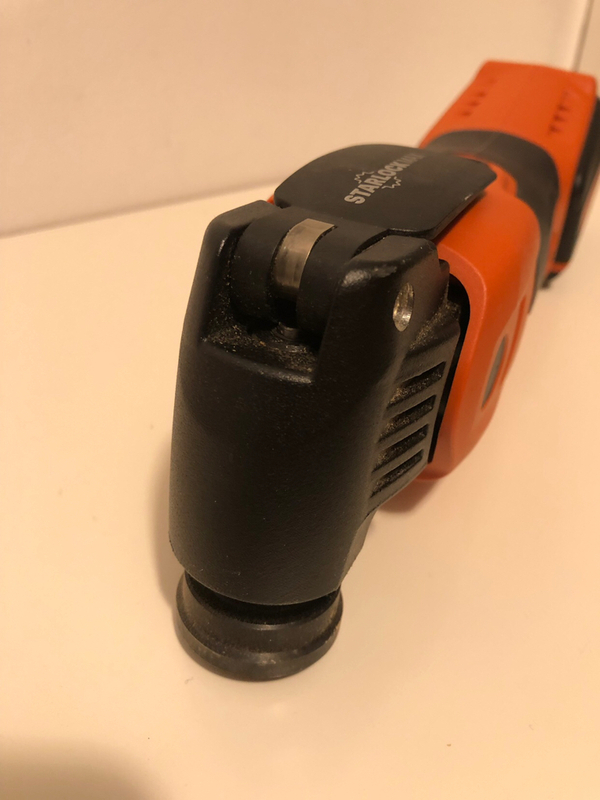 The aluminum dust collection bolt on adapter only fits the Supercut. I tried it on the Multimaster, different head shapes prevents it. Can you please verify that the MM that you tried this on was a 350 QSL? Can you please verify that the SC that you used is the same version shown in the images above? Was the shroud too large for the MM? If not, did the head of the MM not fit through the opening in the shroud? Would a little material removal (from the shroud) or adding something to it allow it to fit? I'm just trying to picture what the issue of incompatibility is. Your post reminds me of so many customer service interactions I've had with companies. It's just terrible. While I would like to blame the customer service person on the other end that's probably not the real problem. Yes they should be more knowledgeable but I think that's more of a company issue rather than an employee issue. Seems like they train people to try to get consumers not to use customer service. Your dealings with Fein remind me of trying to deal with Sony. What a complete waste of time. On the flip side we've got Festool Lebanon which rocks. On a side note, if anyone is looking to buy something from Fluke, Flir or Testo (and I have stuff from all of them) I'd recommend seriously going with Flir. I like their stuff anyway. However, I had an issue with a Flir tool last year and they were rockstars about it. I was impressed. They handled it and their staff knew the product line. Back on topic, I have the older Fein MM with the black plastic shroud thing, pretty much useless. Too bad the shown one doesn't fit the older model. It's now almost the end of February and I'm no closer to an answer then I was back when I first reached out to Fein on the 31st of January. For the last couple of weeks I've been waiting in vain for some news promised to me by the Customer Service Manager (who plays a starring role in my original post). Last I heard, "...one of my technician [sic] is testing a few options. We should have a response for you next week." That was on the 8th and it's been radio silence ever since. I did hear back from most of the retailers I reached out to (who have this part for sale on their respective websites) but not a one was able to provide an answer. I also reached out again to the one Canadian retailer who was the most helpful of all but he still doesn't have stock of the two items so is still unable to test my hypothesis. I have the latest 18v brushless Supercut with isolated head. I have the aluminum bolt on dust collection shroud. Works great. I bought the latest 350QSL from a local HD to see if it would fit because it to has bolt mounting location below. The dust collection shroud did not fit. The heads are enough of a different shape that it would not slide on. I did not look close for ways to modify. @The.Handyman - Hmmm, so the fact that the shroud is too tight (a.k.a the MM's head is "too big") gives me some hope that maybe some strategic removal of material from the interior of the shroud will permit it to slide into place on the MM. I will pursue this notion if whatever I end up hearing from Fein isn't good news. There's a short list of all models it's compatible with. I assume, if it was compatible with other models, they would list them. So not sure why it seems so hard for anyone to answer your question. Thank Oliver! Yes, I am well aware of the compatability list. What started this whole thing off was simply that the part looks so much like it would fit the MM that I wondered a) if by random chance it did fit and b) if it didn't, what would need to be done to make it fit (because, again, since the MM and SC look so similar, I figured there might be an easy mod that would facilitate the fitting of the shroud). I didn't want to waste time and money buying the part and having it shipped to me only to find out that there is no way to make it fit. So, yes, I agree that it's bizarre that someone at FEIN can't simply test out my hypothesis. That said, if I can infer anything from the radio silence it's that the part doesn't fit but is close enough to being able to fit that FEIN has been persuaded to see what can be done to make it fit and/or is pursuing the idea of producing a version specifically for the MM. OK, after more than a month of dogged persistence, I was finally offered the opportunity to have a telephone conversation with a 14 year veteran of FEIN U.S.A., a technician purported to be a specialist when it comes to the MultiMaster. Having just gotten off the phone with this person, I can now report that because the dust shroud will not properly fit over the head of the MM (the shape of the MM's head is just different enough in shape from the SC's) it will not seat properly such that the mounting bolt holes on the shroud will mate up with the threaded inserts in the head of the MM. However, what might still be a possibility is to modify the shroud (by strategically removing material from the inside of the shroud) to allow it to fit around the MM's head in such a way that the bolt holes will line up with the threaded inserts. If I can find a shroud for a reasonable price (I'm looking into importing one to pay the least possible amount) I will purchase it and thereafter analyze its potential for a modification. I raised the notion of doing so with the technician but he was unwilling to budge from Fein's policy on not discussing user modifications. Nevertheless, before I ended the call, I requested that this employee file a suggestion with his marketing department for FEIN to manufacture a dust shroud for the MM. This seems like such an obvious accessory I am stunned that nothing has yet been made available. So, who knows, maybe one will magically appear? Beavertools has the dust shroud, 92602075018, Fein Dust extraction device. I've had mine for alot of years, works especially great cutting drywall. Just as I said earlier. I have the aluminum shroud on my cordless Supercut and I tried it on the corded multi master. You could probably use a die grinder and remove enough aluminum on the shroud to get the bolt holes to line up. I had no need to do so myself, was just testing fitment. Thanks, but that's not the bolt-on version. I think the least expensive option will be to find a retailer in Germany who is willing to ship the shroud via DeutschPost Brief International which, for an item as small and relatively lightweight as this, will cost less than 8 euro. That, plus the savings from not having to pay GST and the further savings produced by the rate exchange, should make buying direct the least expensive option. Unless, that is, someone decides to post the shroud on eBay where I can take advantage of a sitewide discount or bucks promotion, etc. I guess you never saw the post in which I tagged you asking you for more info. Yes, I have had the same notion but to finally hear from you (who owns the magic combination of a MM 350QSL, a cordless SC and the bolt-on shroud) that you think it would be possible to remove some material from the inside of the shroud to allow it to fit properly on the MM gives me some additional hope that this can in fact be a solution. @leakyroof - yes, may I never have to have anything to do with Fein ever again in my entire life! Accordingly, I will be picking up a Festool 203258 and using the various fittings it includes in conjunction with my 350QSL MM. Problem finally solved. 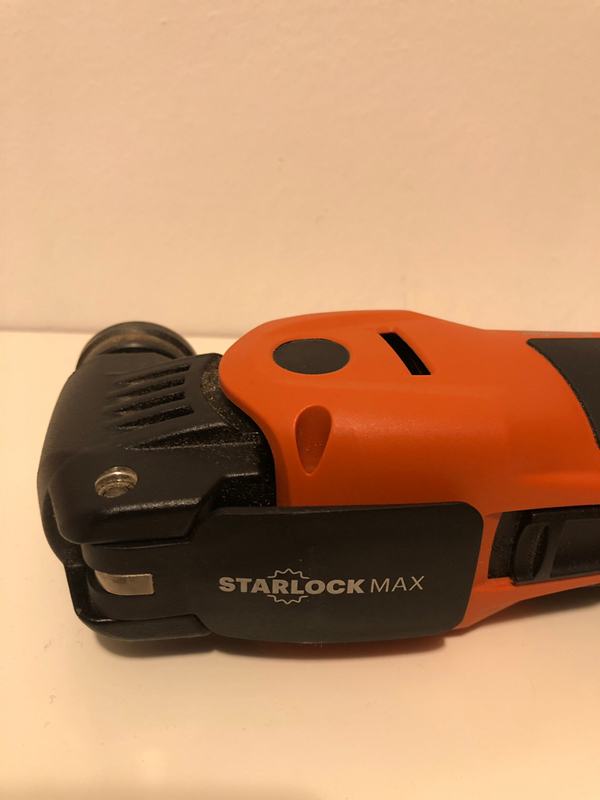 I too want to get this set to use with my starlock MM350. Can someone Provide me details of how I can get one, being that i live on the US side of the Atlantic? My email is available if someone has any useful info. No luck on eBay.